The story let's fight Ghost was smoothly on its way. We were enjoying and were curious as how many ghost will they encounter. The ghostnet Guys were too friendly and funny all they wanted to do they never give up and find a way to make things happen their way. The episode starts when ghostnet guys showed their love to junior Bong Pal, as promise they send the exorcism amount to Bong Pal. Hyun Ji seeing a large amount of money in Bong Pal's account become too greedy suggesting we should bu this this this you are too rich why you act so petty. Bong Pal rudely mind you own business. Finally the ghostnet guys got chance to brief Bong pal about what they are up to, their actual motive was to recruit Bong Pal no matter what and earn lot of money to pay off their debt. They also offered Bong Pal the cases but Bong pal didn't agree to join. As for the cases he was happy to earn. They also offered him the car and three bank note for per exorcism. Bong Pal smiled and agreed to it. But when they again ask Bong Pal to join the club he reject saying he is not interested. Professor Hye Sung was to suspicious from the first episode as Mong Muyung had the feeling there is bad energy around him somewhere same we feel his character is misfit being a cool professor something is fishy about him. We tried to caught on him back but couldn't get on the details, except he can kill see ghosts and out of anger can kill anything just strangling the neck with with hand. We were shocked when he invited Bong pal and Seo Yun for lunch. It seems he is up to digging something. Also we had a feeling that he is the one connected to the death of Hyun ji and Bong Pal's mother. 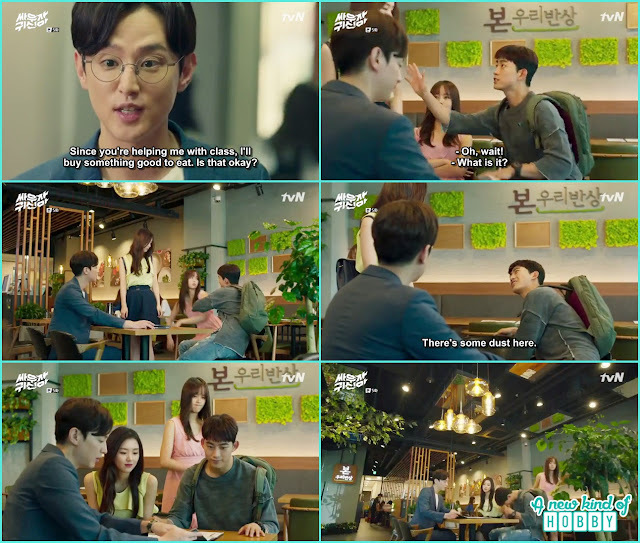 It was another hilarious scene when Bong Pal ignore Hyun Ji and ask Seo Yun to sit beside him. Hyun ji take out her anger by hitting Bong Pal's head badly that every one notice and we laugh. So it was all planned by professor to get close to Bing Pal and talk about his family. Then my sister again said i was right about him he appears too suspicious i think he is made up of all bad energies. Now he will try to mess up Bong Pal's happy life. He also knew about Hyun Ji, Monk Myung and Bong's Father. Hyun Ji was upset and she left alone, Bong Pal came finding her he was the one who was sticking with the glue ehehehe. Hyun Ji tease her "oh Its Seo Yeon", Bong pal surprised and look around Hyun ji laughed, then Bong Pal ask did you enjoy making fun of me? Bong pal wasn't the one to sit back and do nothing he took revenge on Hyun Ji there is something on your shoe. Hyun Ji looking Down to see what's it, Bong Pal said "What a nice bow" funy han. Hyun ji become angry saying "You are so imature, that wasn't funny". The drama wasn't scary but funny due to the ghostnet guys. 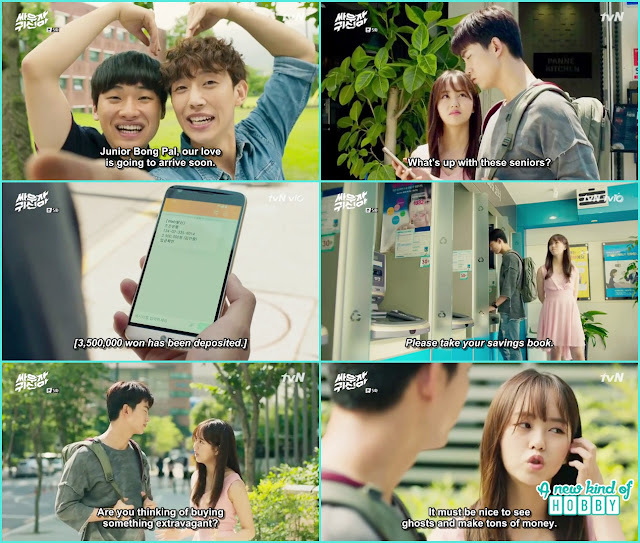 They somehow make Seo Yeon to join their club and now was planning to drag Bong Pal along using Seo Yeon as bait. The story wasn't as simple as we were watching and enjoying, it was too shocked to see Bong Pal's family picture in professor Joo Hye possession. That wasn't all he also searched the place where Bong Pal lives, this shows his evil intentions. 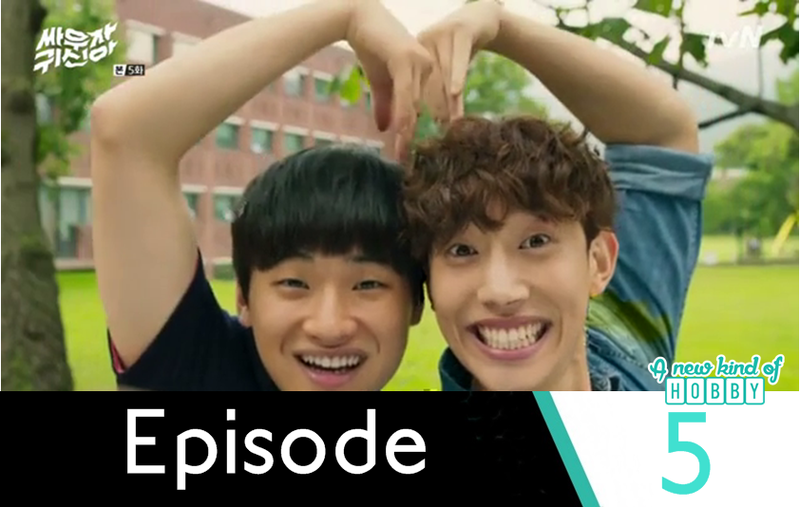 We become worried for Bong Pal and Hun Ji what if professor use both of them for his evil plan. On the way back from Bong Pal's building he saw Monk Myung and said "Its been a while". Listening this Monk Myung suddenly feel the bad energy but couldn't get what it was. For professor he remember the sight of Monk Myung from the past when he was offering some prayer at the temple. Both the goshtnet guys were all set to drag Bong pal. They even bring a van for Bong Pal for exorcism transportation. In Rang the younger one suggest they will use this van for sleeping as they have no where else to go. They were trying to catch two birds with one shot. Chun Sang hit the van and bumber was displaced so it was an old use van they adjust it but using lot of scotch tape lolx. Chung Sang told Bong Pal about a haunted building where no body could sleep due to the children ghost running at night. We though this scene was surely be interesting to catch a child ghosts but we never imagined it would be the most scary scene till now. Bong Pal along with Hyun Ji searched the apartment. We got scared when Bong Pal opened opened the cupboard and it was Hyun Ji, out heart was about to burst, why on earth she is pulling jokes like this. Finally Bong Pal caught the child ghost and told her its not his place to play "People can't sleep because of him". But the child ran away bitteng at Bong Pal's hand. At the same moment Bong Pal saw some other bad energy he threw a fit but it was Chung Sang. He was sure there was something he saw as we agree with Bong Pal there might be something else. When they came back home Bong Pal searched about the building and find out something. Internet now a days make thing too easy for every one to search and knew all the happenings in the surrounding with details. Reading the details Bong Pal head back toward to the building and told Hyun Ji its not a child ghost who was making noise but its some one else the child ghost is trying to run away. I read he was abused and strangled to death by his step father. 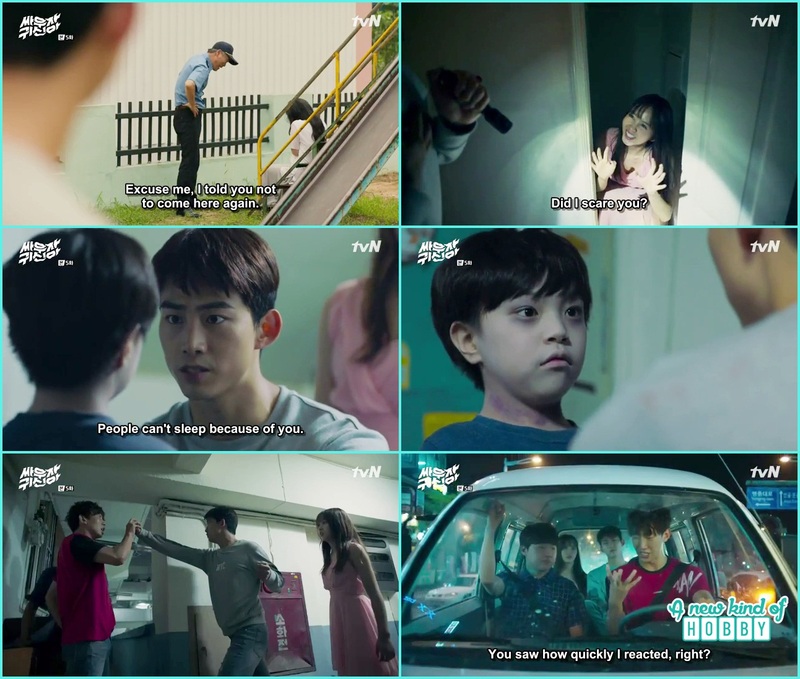 Bong Pal encounter the step father ghost it was really the most scary ghost till now in the drama. We have seen many super natural elements in kdrama and surely get scared for sometime and become normal after wards saying its fiction these supernatural thing exist and all what is shown is a made up by humans to imitate super natural elements. But this scary ghost made us scared for many days, me and my sister couldn't take a proper peaceful sleep. Writing about this scene review makes us a it scared as we are currently watching the scene again . The step father was too scary and evil how he end up abusing and killing a child for no reason and after death also he is not satisfied with the child ghost. Bong Pal took out all his childhood anger at this scariest Ghost and made him vanish away from the world. The ghost child met his mother with the help of Bong Pal and Hyun Ji and left in peace. We feel grieved as Bong pal remember his mother ghost leaving away. On the way back Bong Pal saw Monk Myung drinking alone at the convenience store. He call Bong Pal to have a drink we feel pity for monk Myung but couldn't be any help to both of them. As for my sister she was feeling that the evil professor might drag Monk Myung along with Bong Pal to take out his revenge or anger of something. 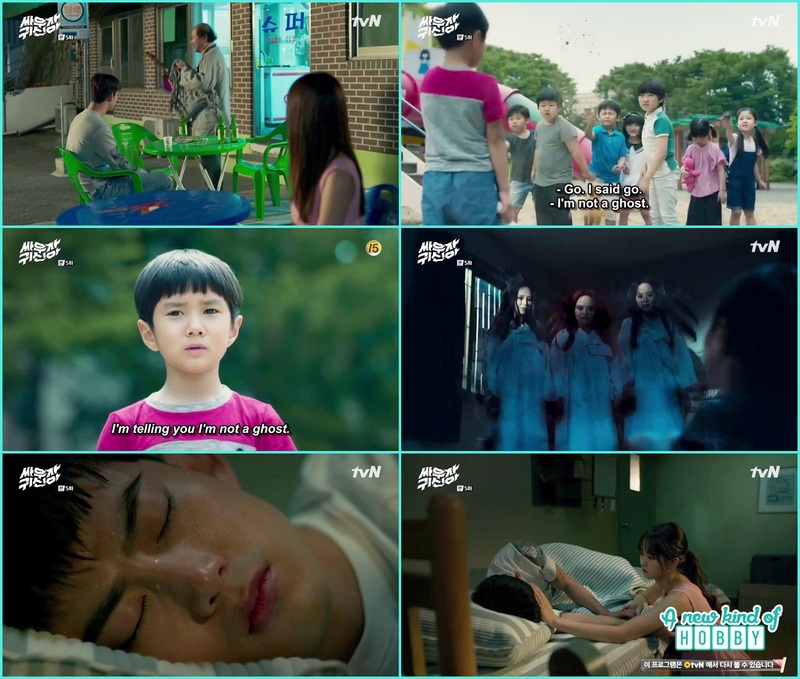 Hyun Ji saw another sight of Bong Pal when he was sleeping, he saw his miserable childhood where his class fellows call him a ghost and cut him out not to play and talk with him. Though he explained he is not a ghost but a normal human. He also points the place where the child ghost were playing. The children got scared and run away. Also when he was alone at home the scary female ghost came and scared him, he started crying "Go away , i am sorry". This shows when he was a child the evil ghost want to get a possion of him but due to his will they couldn't. 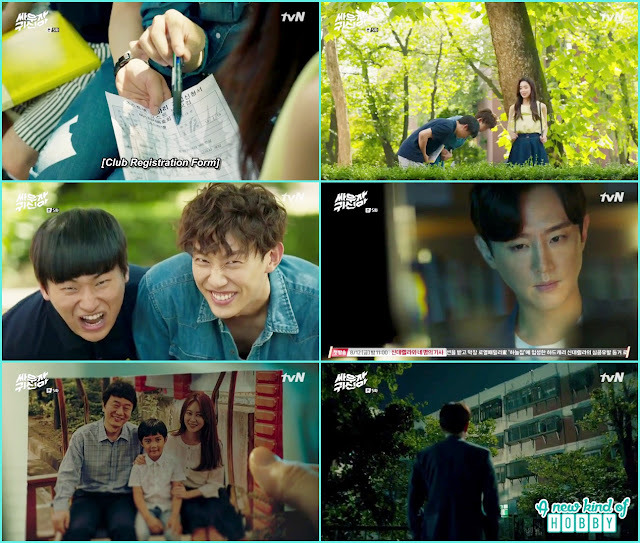 The episode end when Hyun Ji tried to comfort Bong Pal by wiping his tears and patting his shoulders. All we are curious what will going t happen next Do Hyun Ji starts to feel about Bong Pal as a man. How can a ghost develop feelings for a human? Beside these there were too many uncertain questions we were curious about. Its all for now lets meet in next episode review.